As Britain’s weak Tory government clings on – and numerous social, political and economic shocks threaten its downfall – a key factor is whether the Labour Party can provide a mass alternative to harsh austerity. This is one of the main themes in the British Perspectives document for the Socialist Party’s national congress in March, drafted by HANNAH SELL, from which we print edited extracts. In the January 2017 British Perspectives document we raised the possibility of Theresa May calling a general election. We concluded: "Despite all of these reasons to avoid a snap general election, it is not precluded that the Tories could be forced to call one. If May faces deadlock in parliament over the question of Brexit, in order to try and gain a more stable majority and therefore room to manoeuvre, a general election may be her only way forward". Particularly important among the reasons she should hesitate to do so was our prediction that, "despite Labour’s current poll ratings… it is not ruled out that – if Labour was to fight on a left programme – it could win a general election". At that stage, we were virtually alone in arguing that a Jeremy Corbyn-led Labour Party could win. In the event, of course, May gambled and ‘lost’. She clung to power, but with her already thin majority obliterated, only able to stay in government propped up by the Democratic Unionist Party. Without doubt, the Tories’ incompetent election campaign and May’s robotic performance were factors in the result, but not the most important ones. The dynamic of the campaign was transformed by Labour’s election manifesto which enthused millions of people, particularly the young. Labour got over 40% of the vote compared to just over 30% in 2015, the biggest increase in the vote share for any party since Labour in 1945. Correctly, the Socialist Party did not stand candidates as part of the Trade Unionist and Socialist Coalition. Instead, we campaigned for a Corbyn government with a socialist programme. There have been many positive results from the general election. The government is rightly perceived as extremely weak. Corbyn’s programme has reached much wider layers than previously. For many young people it is the first time they have heard the need for nationalisation being put forward and, since the election, support for many of Corbyn’s policies has grown significantly. A Populus poll in October 2017 found that big majorities support the nationalisations put forward in his manifesto. Water topped the poll (83%), followed by electricity (77%), gas (77%), and the railways (76%). The same poll found that half of the population supports the nationalisation of all major banks, which was not in the manifesto. Despite the many positive factors, the post-election landscape is complicated. Some very important strikes and campaigns have taken and are taking place, particularly at local level and on the railways. There have also been some significant struggles of groups of precarious workers, including the magnificent victory scored by the first McDonald’s strike in Britain. Overall, however, the level of struggle is quite low. The potential for mass movements on a wide range of issues is clear, given the obvious weakness of the government and the enormous accumulated anger at austerity and inequality. Nonetheless, the uneasy calm could continue for a period. There are a number of reasons for this. Central is the role of the majority of trade union leaders and also of the Labour leadership. The right-wing union leaders, who were determined to get rid of Corbyn just months ago, are resigned, for the moment, to his continued leadership for a period. They are quite happy to lean on and stoke a certain mood of ‘waiting for a Labour government to save us’ in order to avoid organising a serious national struggle against continued pay restraint and austerity. There is nothing fundamentally new in their approach but, ironically, the increased hopes of a section of workers in Corbyn make it easier than with the previous Labour leader, Ed Miliband. At the same time, the whole preceding period – where the TUC leadership organised a successful public-sector general strike in 2011 but then stepped back from leading a serious struggle against Tory austerity – has left the majority of trade union leaders extremely passive. They treat the crumbs that the government has been forced under pressure to give on pay not as a sign of weakness, showing the possibility of smashing the pay cap, but as gifts to be met with gratitude. The Labour leaders also bear responsibility for the complications in the situation. At root, their limitations stem from their reformist outlook, believing that their task is to win gains for the working class within the constraints of the existing capitalist framework. Their hope, shared by millions, is that they can win a parliamentary majority at the next election. In order to achieve this, they have concluded that it is necessary to compromise with the pro-capitalist wing of the Labour Party. This is a fundamental error. Meanwhile, the right wing has been forced to appear reconciled to Jeremy Corbyn’s leadership. Yet, behind the scenes, it continues to work to push him to the right and to take whatever opportunities arise to undermine him. Despite the limitations of Corbyn’s programme, his most radical statements horrify the capitalist class and their representatives in the Labour Party. Not least, they fear Corbyn’s record of activism. He should not have given an inch to that fear. Had he used his platform as Labour leader to call for serious movements against austerity and its effects the government could have collapsed by now, with Corbyn swept in on the back of mass mobilisation. To give just one example: the mood of raw class anger that followed the Grenfell Tower disaster. At the time, Corbyn rightly called for the requisitioning of the empty properties of the rich to house the homeless. Six months on and more than 100 Grenfell families have yet to be rehoused and the properties of the rich remain empty assets on their property portfolios. Had Corbyn spoken to mass meetings in North Kensington putting this forward, the class anger would have been transformed into a movement on housing centred on the borough but with a London-wide or even national scope. This is not the only time that Corbyn has been silent on the need for workers and young people to get organised in defence of their interests. It is undoubtedly a factor in the electoral ‘youthquake’ not yet having been transformed into a movement for free education, despite the clear potential for it. Nor has he called for national action in defence of the NHS, or to smash the pay cap. Nonetheless, unlike any Labour leader for generations, Corbyn can be pushed to support movements when they develop from below, and which can then increase confidence to struggle. The lack of a lead from the top, however, will not indefinitely prevent new mass movements developing, possibly very quickly. Both the Brexit referendum and the general election result were glimpses of the deep-seated anger with the existing order which is widespread in society, particularly among the working class and a considerable layer of the middle class, especially the young. When new viable outlets for this anger emerge, they will be seized, just as the Brexit referendum was, creating new upheavals which will again throw all the existing political parties into further turmoil. Movements could develop on a whole range of issues, including the catastrophe facing the NHS. The Labour leadership’s mistaken approach reflects its programmatic limits. The election manifesto marked a radical break with the neoliberal policies of Labour over recent decades. Nonetheless, by historical standards the programme is very modest, far more limited than was put forward by Tony Benn, or Jeremy Corbyn, in the early 1980s. Benn called for the nationalisation of the banks and the top 25 monopolies. It would be inaccurate to describe Corbynism as rounded-out left reformism. It contains elements of this but is much more limited. Although Corbyn would consider himself a socialist, and is seen as one, he does not raise his programme in terms of the need for a fundamental change in society – for an end to capitalism and the building of a new socialist order. Corbyn’s approach is connected to the beginnings of the new era of radicalisation we are passing through. Corbyn was correct when he said in his conference speech last September that "2017 may be the year when politics finally caught up with the crash of 2008", although it would be more accurate to say that it began to catch up. There was enormous enthusiasm for Labour’s radical election manifesto, but there is not as yet mass pressure pushing Corbyn further to the left. The Labour Party remains two parties in one: a pro-capitalist party and a new radical party in formation around Jeremy Corbyn. Had a concerted effort been made to mobilise the new ‘Corbyn layer’ – with the goal of waging a political struggle to remove the pro-capitalists from their positions and completely overturn the party’s undemocratic structures consolidated over 20 years under the Blairites – hundreds of thousands would have been enthused to do so. Moreover, in the course of the struggle, they would have drawn more far-reaching socialist conclusions. Unfortunately, the leadership of Momentum (the main pro-Corbyn group in the Labour Party) has acted to ‘police’ the left, keeping out more radical forces, including the Socialist Party, and attempting to keep the movement within channels which the Blairites could live with. Momentum’s main selling point is not its programme or involvement in struggle but its ability to teach people to canvass in elections. As a result, while a broader layer was drawn in to door knock in the general election, in most areas there is limited activity of the fresh layers in the sterile structures of Labour or Momentum. On the contrary, the top-down and unpolitical atmosphere, combined with the Byzantine structures put in place by New Labour, tends to attract mainly the least radical elements into playing an active role. The individual attempts to remove a few Blairite MPs are to be welcomed, as are any measures to re-democratise the party, but the limited steps taken so far do not alter the general picture. The layers of society that have been drawn into activity are of a mixed character, including a large layer of the radicalised middle class. As the junior doctors’ strike in 2016 demonstrated, wide sections of the middle class, especially among the young, are being radicalised by the failure of capitalism to offer them a future that matches their expectations. They are increasingly adopting working-class methods of struggle. This is a very important section of society. Many can be won to a revolutionary programme in the future. Nonetheless, they do not yet have a fully working-class outlook. If becoming active in the Labour Party meant becoming active in a workers’ party, where the organised working class set the tone, it would be part of completing the process of winning them to a working-class outlook. Unfortunately, this is not the case. There is also a layer of young working-class people who have joined Labour, even if most are not currently active, but they are not the driving force. Partly, this is because they are mainly in unorganised workplaces and do not yet have experience of struggle, although there are important first steps to this changing with the McDonald’s and Deliveroo strikes. Their consciousness as Labour Party members is therefore more individualistic than seeing themselves as part of a class at this stage. This is not necessarily a permanent feature of Corbynism, and is certainly not a permanent feature of mass left formations. While a majority of the capitalist class hope that Jeremy Corbyn would be more malleable to their interests on Brexit than the Tories, they fear the massive radicalisation his election would trigger, and that he could move dramatically to the left under pressure from below, particularly in the face of a new economic crisis. This is what the Economist meant when it feared that Corbyn could see a new financial crisis as ‘Act One in the collapse of capitalism’. The Financial Times feature on ‘how to hedge your finances against a future Corbyn government’ quoted two well-known City fund managers arguing that it is "fear of a Labour government, rather than fear of Brexit, which is depressing the valuations of domestically focused UK companies". In reality, it is both. The capitalist class is stuck between a rock and a hard place, unable to see a way forward. On balance, it would much prefer to keep the Tories, led by May, in power for as long as it is viable. Therefore, while the government could collapse at any point – felled by Brexit rows, even by further sexual harassment or other scandals, or by a social explosion – it is also possible that it will cling on to power for a period. Even without a new stage of economic crisis, Corbyn would be under huge pressure from below as a result of the misery the working and middle classes have suffered over a whole period. Corbyn’s election programme raised the sights of wide sections that an alternative to austerity was possible. However, unless it is accompanied by a general struggle to implement it, against the opposition of the capitalists, scepticism can return even among those who have been enthused. In addition, while it is positive that the Labour Party in Scotland now also has a more left-wing leader, Richard Leonard unfortunately supports a continuation of Labour’s incorrect position on the national question. Labour did recover some votes in Scotland during the general election, but the numbers (around 10,000) are just a fraction of the 3.5 million votes gained in England and Wales. Some further gains can be made but they will be limited unless the Labour Party, at least, clearly supports the right of the Scottish people to determine their own future. Moreover, the desire to compromise with Labour’s pro-capitalist wing is leading to retreats on programme. This is particularly the case on Brexit, where the capitalist class is exerting significant pressure for Labour to put a position which suits its interests. In the general election Corbyn began to make some headway among workers who had voted for Brexit by stating that Labour accepted the referendum result and, more importantly, by stressing that he wanted a Brexit in the interests of working-class people and would fight against employers carrying out a race to the bottom. He combined this with statements against racism and in defence of the rights of members of other EU states residing in Britain. As we explained at the time, at root, the working-class vote for Brexit was a revolt against everything it had suffered at the hands of the capitalist establishment. Unfortunately, not least because Corbyn abandoned his historical position of opposing the EU as a bosses’ club, there was no mass working-class or left voice expressing that revolt. The Socialist Party, alongside the RMT, BFAWU and Aslef trade unions, campaigned for a pro-working-class left exit, but our voices were not strong enough to counter the establishment campaigns. As a result, the racism and nationalism of the official pro-Brexit campaigns had a certain effect. Any growth in racism and nationalism needs to be combated. 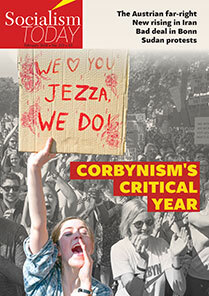 However, the pessimism of the majority of the left, who concluded that the working class had been lost to reaction, was completely disproved by the enthusiasm that began to be generated by Corbyn’s general election campaign. The youth were at the forefront of this but older sections of workers were also stirred by the manifesto, answering the lie that the central dividing line in society is now not class but age. Since the election, Corbyn has allowed pro-capitalist Keir Starmer to make most of the statements on Brexit. Up to now the Labour leadership has at least held back from adopting the pro-remain position that is being urged on it by the capitalist class and the Blairites. The further it goes in this direction, however, the more difficult it will be for Corbyn to make inroads among disillusioned pro-Brexit, ex-Labour voters. One of the entirely spurious arguments of the Blairites for adopting their position is that the young people who voted for Corbyn are desperate for him to do so. This is not the case. Had Brexit been the central issue motivating young people they would have voted en masse for the Lib-Dems, rather than Corbyn. Six months on and Labour’s support among students has grown further to an overwhelming 68%. What is key to winning over workers and young people – Brexiters or remainers – is not Labour’s attitude to the EU in itself, but standing for an anti-austerity programme that pledges to fight for the interests of the ‘many not the few’. This cannot be achieved if combined with a defence of the EU neoliberal bosses’ club. That would mean forming a bloc on this issue with the capitalist class against the forces that made up the working-class electoral uprising in the referendum. Another factor that could act to undermine support for Jeremy Corbyn among a layer of the working class is the role of Labour where it is already in power: in numerous local authorities. While Labour nationally declares itself against austerity, at local level, Labour councils are implementing savage cuts. Unless Corbyn comes out to clearly oppose their actions, many workers – already highly cynical about Labour after their experience of recent decades – can conclude that his opposition to austerity is not serious. This May, most of the major metropolitan councils in England are up for election. Many are Labour-controlled already – 86 out of the 151 authorities with elections – but the Tories are panicking that they will lose some of those they still control, particularly in London. Following the general election, there are now much wider layers of society that are enthusiastic about Corbyn. There will be a mood among some of them, although it is not clear how broadly, that they have a duty to ‘hold their noses’ and vote Labour to further strengthen Corbyn’s position, regardless of who the local council candidate is. How far this will be cut across by the small number of young people who generally vote in local elections is not clear. However, Momentum will be able to mobilise a section of them to canvass for Labour. At the same time, there will be other Corbyn supporters who cannot bring themselves to vote Labour because of the criminal role of Labour locally. There will also be millions of workers who will vote to express their anger at cuts to local services. Where Labour is in power this can mean voting to punish it. The Socialist Party does not favour standing in seats where the Labour left have won selection contests. Instead, we should pressure those Labour lefts to adopt a clear anti-cuts stance, while also encouraging left-wing anti-austerity campaigners to stand against right-wing Labour candidates. This is more important than in previous years because this will be the first election since the broad politicisation that resulted from the general election. This could mean that a bigger layer of workers and young people will be thinking about how to oppose cuts locally. It is also more important because the strengthening of Corbyn’s position means that the Labour left’s attitude to council cuts is being tested in practise. Shadow chancellor John McDonnell has made it clear that he does not think it is possible to refuse to implement the cuts, using the incorrect argument that the law precludes the kind of struggles he supported in the 1980s. It would be a serious mistake if Corbyn and McDonnell continue to put this position, which will be used by councils as an excuse not to pursue the legal no-cuts budgets that are entirely possible. Unfortunately, it seems that the approach of ‘Corbyn councils’ will be on the same lines as the Bristol mayor, Marvin Rees. He has called anti-cuts demonstrations to put pressure on the government to stop its austerity programme. This is to be welcomed – but has been combined with continuing to implement the cuts! Nonetheless, Rees’s actions have raised the possibility of stopping council cuts, and given greater opportunities for us to put the case for councillors to refuse to implement austerity measures. It is therefore vital that we take the opportunity, including by standing in elections, to put our programme for anti-cuts councils as an essential prerequisite for building a movement to defeat the government over local cut-backs. Of course, there are bound to be Corbyn supporters who push aside their worries about council cuts such is their desperation for a Corbyn-led government. Our duty is to warn them that a wrong approach to local government could damage the chance of a Corbyn victory, and to point out that the sabotage a Corbyn government would face from the capitalist class is as nothing to that seen so far. Just as with the Tsipras government in Greece, capitalism globally would try and make an example of a Corbyn-led government, aiming to show to the British working class, and to workers internationally, that the left offers no way out. This does not mean that a Corbyn-led government could not introduce reforms, but it would be doing so in the face of the open sabotage of the capitalist class and the global financial markets. To successfully introduce any significant reforms would therefore mean mobilising the power of the working class in support of the government’s policies. Faced with the fear for the continued existence of their system, the capitalist class can be forced to go further than their system can afford. This would not stop their attempts at sabotage, however, and the only way to combat them decisively would be to take the commanding heights of the economy into democratic public ownership and to begin to build a socialist planned economy, calling on workers across Europe and the world to take the same path. It cannot be excluded, under the impact of mass working-class movements, that Corbyn could go much further in this direction than he currently intends. However, his approach so far – at best ‘living with’ Labour councils implementing cuts and a majority of pro-capitalist Labour MPs – does not auger well. The Socialist Party has an important role to play in reaching out to the hundreds of thousands of workers and young people who have been awakened to the idea of struggle and socialism in the last year, fighting alongside them and explaining what is necessary for the successful socialist transformation of society. Key to that is the existence of a mass party capable of leading the working class in that struggle.